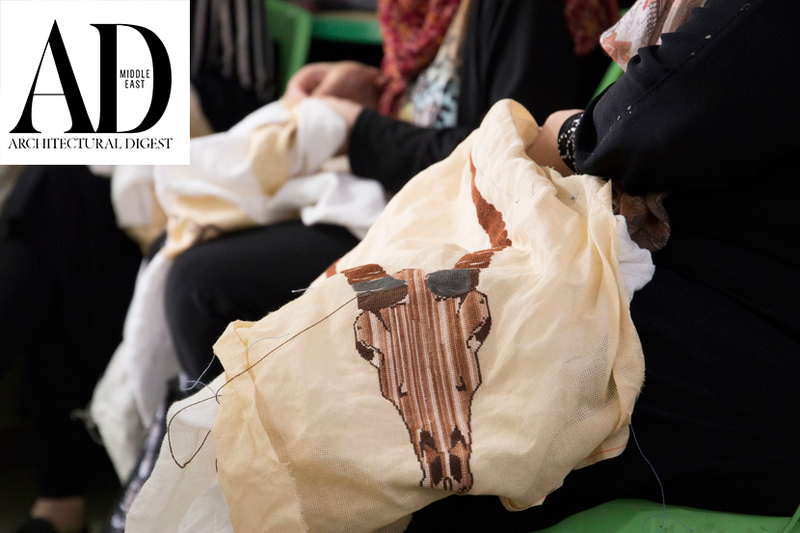 “We were always very appreciative of the art of tatreez, the traditional Arab-Palestinian embroidery,” says Nesrine El Tibi Maalouf, co-founder of 81 Designs, a UAE-based social enterprise that has recently displayed the work of Palestinian refugee women at this year’s Abu Dhabi Art festival. Founding the organisation with her daughter Nadine nearly three years ago, Maalouf wanted to create an outlet to support women in under-privileged areas by partnering with creatives from across the region. For their latest collaboration, the mother-daughter team is working with Lebanon-based surface fabrication studio Bokja. Known for its quirky transformation of discarded antiques, Bokja creates exuberant furniture decoratively covered with layers of vintage textiles that is meant to represent the many layers of Beirut. The studio also tries to project a meaningful social message through its work. Creating pieces that range from furniture to art, the 81 Design co-founder describes the work as tatreez with a modern twist. For example, the debut collection reinterpreted works by acclaimed Tunisian artist eL Seed through embroidery, and last year’s collection had the women cross-stitch renditions of 14 pieces of pop art by renowned British-Moroccan artist Hassan Hajjaj. Earlier this month, 81 Designs and Bokja presented works honouring femininity and Palestinian tradition at the 10th edition of Abu Dhabi Art with the Standing Tall exhibition, a project made up of five sculptures of women adorned with 100 embroidered fragments on the wall. 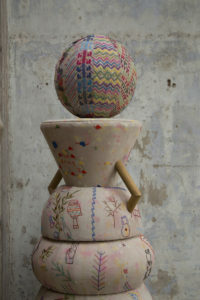 Made of stacked poufs upholstered with textiles gathered from around the world, each totem represented a female attribute: independence, empathy, compassion, nurturance, and strength.